Visitors to Thailand's remote but picturesque northwestern province of Mae Hong Son have long been able to enjoy such diverse and exciting attractions as elephant riding, white water rafting, jungle trekking, rock climbing and visiting the many hill tribes of the region. 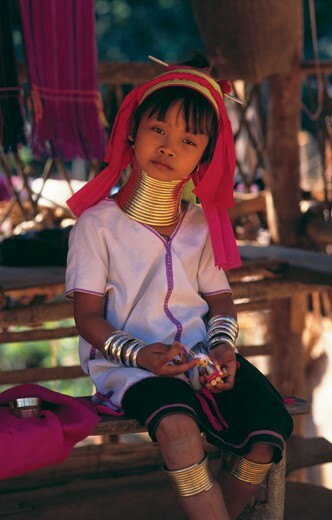 Then, some years ago, a new attraction appeared - the so-called "Long-Neck Karen hill tribe", much touted as an attraction by Thai tourist companies and the Mae Hong Son provincial administration. Unfortunately the reality is less appealing. For the ‘Long-Necks' are in fact the photogenic Padaung, a unique sept of the greater Karen people who inhabit the Thai-Burmese borderlands. Driven from their homes in Burma's Shan State by the bitter internecine warfare of the area, they sought temporary refuge in Thailand where they became, effectively, exhibits in a human zoo. Now, as peace talks between the Burmese authorities and the minority insurgents of Shan State proceed, the Padaung are hoping to return home. Andrew Forbes and David Henley of CPA Media investigate. The Padaung - or, as they prefer to call themselves, Kayan - are an ancient people, proud of their unique cultural heritage, whose chief desire seems to be the resumption of their formerly peaceful and prosperous existence on the traditional Padaung lands around Mong Pai, south of Taunggyi, on the borders of Burma's Shan and Kayah States. In addition to this irrigated land - used almost exclusively for wet rice cultivation - the Padaung also raised various dry land crops, such as maize, millet and cotton, whilst the “prolific numbers of cattle and pigs also attested to the general prosperity.” Nor did this wealth rest solely on agriculture. The Gazetteer continues: “The Padaung is a trader, too; many bullocks are kept solely for pack purposes, and salt and betel nut are imported from Taungoo [on the plains of central Burma] in exchange for rice and cotton.” In sum, the archivists and accountants of the British Raj found in some of their newest subjects - the Padaung - a confident, relatively wealthy and well-organised community. The practice of placing brass rings around the necks of the women to make them appear elongated originates from Kayan mythology. This recounts how a beautiful dragon with a long neck was impregnated by the wind to produce the first Kayan people; today Kayan women wear brass neck rings to imitate this mother figure. Beyond their most unusual neckwear, the traditional dress of Padaung women does not differ very greatly from that of their Karen sisters. The head is usually covered with a simple scarf wound into the hair. The coat is a long woven blouse with a v-neck and short arms slipped over the head and ornamented by a coloured border, whilst the skirt is generally a short striped blue and red garment reaching to the knees. The forearms are usually ornamented with heavy silver bracelets, whilst just below each knee there are more brass coils similar to those worn around the neck. The brass used in making Padaung neck-coils was traditionally obtained from the northern part of Shan State; though today it may be imported from anywhere it may be available. Young girls begin to wear neck-coils well before puberty - often as early as five or six - and additional coils are added as thet grow. By the time a Padaung woman reaches adulthood she may have as many as twenty five of the wide brass rings extending from her collar bones upwards to the vicinity of her ear lobes. The total height of this brass column may be 30 centimetres, and the weight as much as five kilogrammes. To Padaung traditionalists, the result may be fetching; to outsiders it seems, to say the least, strange - though perhaps more apparently uncomfortable than aesthetically unpleasing. The authors of the Gazetteer considered that 'the appearance of a Padaung woman, with her small head, long brass bound neck and sloping shoulders... inevitably suggests a champagne bottle'. Certainly, to the outside eye there is something of the long-necked jar or vase about traditional Padaung female; the small brass ring mounted on the coils at the nape of the neck only serves to confirm this impression of a vessel used for pouring. Under British rule the Padaung continued to live in their traditional way, protected to some degree (like all Burma's upland minority peoples) from the cultural pressures of the majority Burman population. Following independence in 1948, however, the Kayan found themselves unwillingly but inevitably caught up in Burma's civil wars as all their neighbours - first the Karen and the Karenni (1949), and then the Shan (1961) rebelled against Rangoon's harsh rule. Until as recently as ten years ago there were no Padaung in Thailand. Then, in 1987, following a destructive attack by the Tatmadaw - Rangoon's ruthless armed forces - deep into Kayah State, many of the region's estimated 7,000 Padaung were displaced, about 300 of whom crossed Thai-Burmese frontier into Mae Hong Son province. Here they were settled in two villages, Nai Soi and Nam Paeng Din, located a few kilometres inside Thailand but strongly under the influence of the Karenni Peoples Progressive Party (KPPP) - that is, the political wing of the rebel Karenni Army. It didn't take long for all sides concerned - both the KPPP/KA and the local Thais - to realise that the new refugees, with their spectacularly different womenfolk, were a potential money spinner. The Karennis needed all the finance they could raise for refugee support (and, no doubt, for their continuing struggle against the Tatmawdaw), whilst the Thais were eager for a new tourist attraction. Thus the ‘Long-Neck hill tribe' villages were born, with KNPP men guarding the gates of the settlements and charging 300 Baht ($US 12-00) entry for foreigners, 50 Baht ($US 2-00) for Thais. In a short time the Padaung - or at least the 30 or so ‘long-necked' women amongst them - had become, to all intents and purposes, exhibits in a human zoo, paid to be gawked at by all comers. Not that the Padaung seem to mind too much. They have lived all their lives alongside their Karenni neighbours, and they too have suffered at the hands of the much-feared Tatmawdaw. As a result of the relative wealth brought about by the ‘Long-Neck' tourist trade, their villages have become relatively well off. Moreover, unlike other refugee groups who have been pushed back across the Burmese frontier by the Thai authorities, the Padaung and Karenni settlements have been left alone, and even have adequate primary schools and medical facilities. When asked about the cultural impact of this kind of exploitation, a leading Karenni replied: "You cannot stop the tourism. Why should we not benefit? We use the money to buy medicines and schoolbooks. We are also grateful for the publicity for our cause that tourism brings.” At the same time Ma Nang, one of the most photographed long-neck ladies in Nai Soi, commented "I do not mind tourism. Visitors come to see our long necks. We enjoy seeing their different coloured hair and eyes. But life is not better in Thailand. Here, we have no land or rights. We want to return to Burma, but we can't because of the fighting." Now, however, things may well be changing. By employing a cunning mixture of military stick and divide-and-rule carrot Burma's military rulers, with the tacit backing of the Thai authorities, have arranged truces with nearly all the rebel military groups comprising the opposition National Democratic Front. Last year the small Karenni Army also suffered a series of military reverses, whilst its numbers have diminished due to serious factional infighting and diversions. KNPP/KA activities have long been limited to the eastern part of the Kayah State, in the rugged lands between the Salween River and the Thai border, far from traditional Padaung lands. Further to the west, close to the Padaung homelands, a smaller group - the Kayan New Land Council - based in the hills north-west of Mong Pai, has virtually disappeared. Formerly associated with the now-defunct Burmese Communist Party, in 1990 the KNLC was reported by Bertil Lintner, the veteran Burma correspondent of the Far Eastern Economic Review, to number between 50 and 100 men. From the point of view of the Burmese democratic opposition, these developments may well appear disastrous. But to the ordinary Padaung in Mae Hong Son, there now seems to be real hope of an early return to their homeland around Mong Pai. During a recent visit to one ‘Long Neck' village, there was a palpable air of quiet excitement, and many Padaung talked openly of their hopes of return to Burma, if the situation permits, as soon as possible. Still, whilst most Padaung wax lyrical about the clear springs and rich fields of their ancestral home, it is abundantly clear that they continue to fear and mistrust the Tatmawdaw. Grateful as they may be to their Thai hosts, most are eager to leave their ‘human zoos' and to return home as soon as a lasting settlement with the Burmese authorities can be reached.